Name aside, the set is made up of four beers brewed to almost the same recipe, differing in only one element – which hops were used. Hops are an often misunderstood part of the brewing process, adding important flavours at various stages and varying a lot more between the various varieties than us beer laypersons normally think. I’ve stuck my face and hands into various sacks of hops over the years and generally they’ve all been fairly similar – some sharper and more vegetal, some more resiny, but all in all generally ‘hoppy’. As such I bought the beers with an expectation of seeing the variation between the various varieties of hop, but didn’t expect that variation to be all that much – I was Wrong. The base recipe seems to be a new one dreamed up for the project (made with Maris Otter, Crystal and Caramalt malts) and the beer is both hopped during the boil (while the wort is extracting sugars from the malt, dissolving alpha acids in the hops and bringing bitterness to the beer) and ‘double dry hopped’ (which I assume means adding it at two different occasions between primary fermentation and conditioning, at which point the aromas of the hops are more important, as the bitter alpha acids are less soluble at non-boil temperatures. [Apparent ‘having a Clue about brewing’ thanks to home brewing wikis and Andy at Redemption]). The beers have one simple stated aim – to educate people about what the different hops actually add to the beer. While the blog post about the project is typically vitriolic towards brewing tradition it does get across the point that I think is important – to be able to understand the beers that you are drinking and have a better idea what to expect from future brews it’s good to know what flavours the individual components add. The beers. On my balcony. And a mop. First up I went for the Citra. This is one that I’ve become aware of in recent times thanks to the Kernel Citra IPA, which is one that I’ve thoroughly enjoyed from their range of single hops beers, and a hop that I normally relate with a softer citrus nature rather than the full-on green bitter veg of ‘traditional’ hops (by which I mean the unnamed/forgotten varieties that I’ve seen in hop lofts and cellars on drunken brewery tours in the past). Citra is a newer hop variety, part of the wave of American hops that is currently rolling around the world of both professional and home brewing, that seems to have appeared around 2007 and popularised through its use in Sierra Nevada’s Torpedo IPA. Used predominantly as an aroma hop (rather than to add bitterness during the boil) the home brew forums I’ve been reading suggest that it brings a lot of tropical fruit flavours – pineapple, passion fruit and mango – to the brew, but I didn’t get so much of that. On the nose it had some burned butter and caramel sweetness (that I attribute to the base recipe) with a more traditional green hop and cut grass aroma. To taste it was a caramel/butterscotch start leading to a savoury hop bitterness at the end, with lots of green flavours and a lingering vegetable note. The sort of thing that I’d normally expect from a big hoppy beer. I then moved on to the Sorachi Ace, a Japanese hop traditionally used by Sapporo in their lagers but recently appearing in the USA and moving to the rest of the world. It’s described as having a uniquely lemony flavour, but I didn’t really get some much in that vein. On the nose it was big orange marmelade with a hint of pine needles. To taste that continued with lots of spicy pine needles and a long lingering bitter orange, burnt caramel and pine aftertaste. Sappy pine was the dominant flavour for me, verging towards the floor cleaner end of things (maybe cut with a touch of lemon) but never quite getting there. This was a very non-traditional hoppy flavour and one that I will be seeking out again. Next up was Bramling X, the only English hop in the set. More properly Bramling Cross, it was developed in the 1920’s as a cross breed between Bramling and a Canadian variety. It’s a mainstay of British brewing, although generally used as a bittering hop. BrewDog describe it as underappreciated and based on the flavours in this beer I can see why. On the nose it didn’t really do much, revealing the rather boringly ‘beery’ character of the beer, adding only a hint of cut grass. To taste it was quite a shock – smokey, muddy and with dark berry pies – unsweetened stewed blackberries with blackbery leaves. 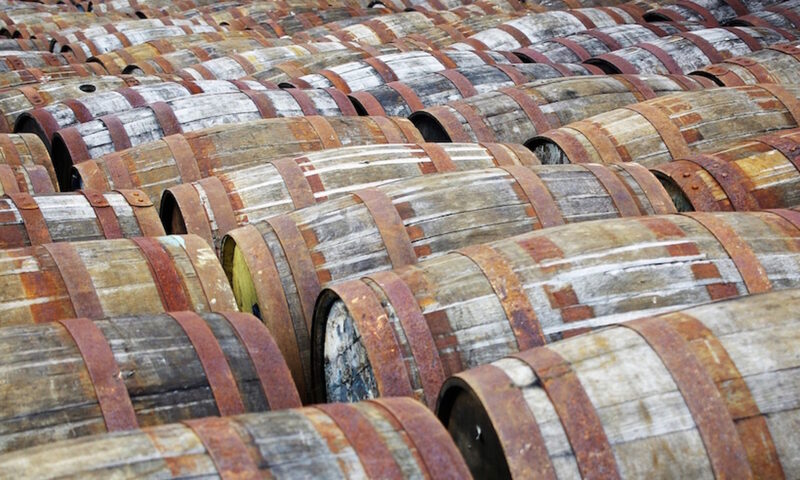 It reminded me a lot of Islay whisky cask finished beer, bringing in woodiness as well as the smoke. A little bit of traditional hoppy greenness popped up as the aftertaste faded, but this was quite a departure from what I expected. The last beer I tried in the set was Nelson Sauvin, currently sitting with Citra as one of the more popular new hops. This one comes from New Zealand and is another one said to bring big fruity flavours, although with a big alpha acid content it also works well in the boil as a bittering agent. On the nose it had mulchy, spicy hops with sap and twigs. To taste it was very savoury (maybe a touch of brocolli at the start? ), moving through a little bit of caramel sweetness with baked cooking apples to a very vegetal and leafy finish with a slab of minerality – the smell of cold gravel (or at least, how I’d imagine that would taste). Much more towards what I’d expect from a big hoppy beer, but with spiciness that was a surprise. 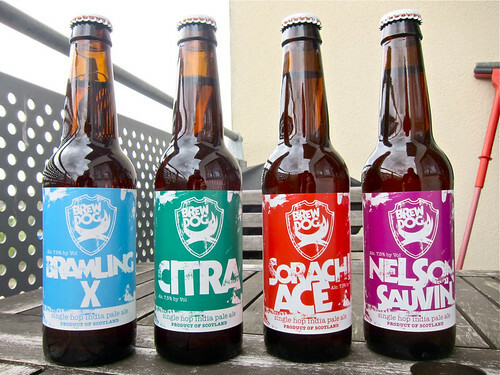 Four very interesting beers and further examples of why I continue to support BrewDog despite their deliberately contrary nature and annoyingly over the top marketing. It’s a brewery that seems to be very much in two pieces – if you dig through the marketing front (courtesy of James Watt and his posse) you’ll hit some interesting beers brewed (by Martin Dickie and chums) with an eye towards innovation and education that home brewers have been pushing quietly for a while.